I never met personally Arne Naess, the Norwegian eco-philosopher, who, according to an Associated Press story, died on Monday January 12th. He was 96. I knew from a fairly recent contact from his wife, that he was in a nursing home and not very well. Naess — like a few others now dead, such as Aldo Leopold, Richard Sylvan, John Livingston, and Rudolf Bahro — profoundly influenced me with his ideas. His deep ecology writings helped orient my life as a green and environmental activist. His Earth-centered ideas and overall philosophy also influenced so many others. His life’s work and his death, will be thought about by those who have been inspired by him and now learn that he has returned to the Earth. Social relativism, i.e. not taking a stand, was unacceptable to Naess in this age of post modernism and ecological destruction. He himself had seen the impact of fascism on Norway during the Second World War. He saw the deep ecology philosophy, with which his name has become associated, as completely anti-fascist in orientation. Speaking of “intrinsic value”, a basic component of this world view, Naess said: “This is squarely an antifascist position. It is incompatible with fascist racism and fascist nationalism, and also with the special ethical status accorded the (supreme) Leader.” (Selected Works, Volume Ten, p. 95.) Naess was an advocate of non violence but made it clear in his writings, that if a choice had to be made, he preferred violence over cowardice. He also saw that self-respect for an individual was important, before a principled non violent stand could be taken and the consequences accepted. Naess defined the “deep movement”, which seeks the transformation of industrial capitalist societies who have brought about the existing environmental crisis, by putting forward seven main points. The article is only a few pages long, but profound and showing the complexity of Naess. He pointed out that biological complexity required a corresponding social and cultural complexity. Outlined is an “anti-class posture” and how anti_pollution devices can, because of increasing the “prices of life necessities” increase class differences. He stressed local autonomy and decentralization. Fred Bender’s 2003 book The Culture Of Extinction: Toward A Philosophy Of Deep Ecology said that Naess, in his initial 1972 formulation of shallow and deep ecology, put forward a very progressive non_dualistic approach, which is the one most compatible with ecology, where every aspect of Nature is interrelated – “all my relations” as traditionalist aboriginals say. Naess also presented in the original essay a sophisticated understanding of cultural diversity and a class and political consciousness. If this had been retained by Naess and other deep ecology academic writers in published writings, it would have blunted all that criticism of deep ecology, much of it emanating from social ecology – that deep ecology was just focused on Nature and had no view of society. Some supporters of deep ecology (I am among them), believe that this philosophy has “stalled”. One example of this is perhaps the elimination of the section on deep ecology in the fourth edition (2004) of the undergraduate reader, Environmental Philosophy: From Animal Rights to Radical Ecology, senior editor Michael E. Zimmerman. This edition has totally dropped the section on Deep Ecology, edited by George Sessions, which was part of all previous editions. Naess, a European, had a positive yet critical attitude towards socialism in his writings. “It is still clear that some of the most valuable workers for ecological goals come from the socialist camps.” (Ecology, community and lifestyle, p.157.) Naess tried to combine revolution and reform: “The direction is revolutionary, the steps are reformatory.” (Volume Ten, Selected Works, p. 216.) Most of the academics in the universities who aligned themselves with deep ecology, however, came to terms with industrial capitalism. They did not see themselves as revolutionaries with a mandate to help usher in a NEW social formation as an alternative to industrial capitalism. The academy has tended to politically neutralize deep ecology. The year 1973 not only marked the publication of the above seminal article by Naess, but it was a time which marked the opening of a deep crack in the paradigm of ruling ideas justifying the despoliation of the planet, and the start of a movement towards an Earth-centered ethics. Other essays and books which were published around that time included Richard Sylvan’s (then Routley’s) essay Is There a Need for a New, an Environmental Ethic?, Peter Singers Animal Liberation essay, and two important books: Christopher Stone’s Should Trees Have Standing? Toward Legal Rights For Natural Objects and Donella Meadows et al The Limits to Growth. The significance of Arne Naess, whatever the real or apparent contradictions, is that his non-human centered philosophy offers us a way forward out of the ecological and social mess that threatens to overwhelm all of humanity and wipe out many of the plants and animals which share the planet with us. It is unfortunate that environmental “stars” – for example, here in Canada David Suzuki, Elizabeth May and Alberta environmental writer Andrew Nikiforuk, or in the United States, Al Gore – have nothing to say publicly about the importance of deep ecology, and why it is crucial that activists should study Arne Naess and apply his thinking to their work for ecological and social change. I would like to close by expressing my personal condolences to Arne’s wife Kit-Fai Naess, as well as to the family and close friends. 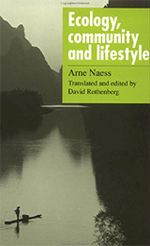 Arne Naess has impacted many lives and shown the necessary direction to significantly change societal consciousness away from human-centeredness and towards Earth-centeredness. Deep Ecology expresses what should be our relationship to the natural world in the 21st century. This is a wonderful and lasting achievement for a person’s life. Editor's note: David Orton is a deep ecologist based in Canada. He had corresponded with and learned from Arne Naess. I am an undergraduate studying a degree in Environmental Sciences at the University of South Africa in South Africa. The time I heard about Arne Naess, I was still at second year doing Environmental Philosophy in 2014 (June). I read his article...Real self realization (Deep Ecology). That article changed my life altogether from how I used to think about nature and how I act.